BREAK OUTS? DARK CIRCLES? REDNESS? L'Oréal Paris has #GOTITCOVERED! Check out this video I did1!!! 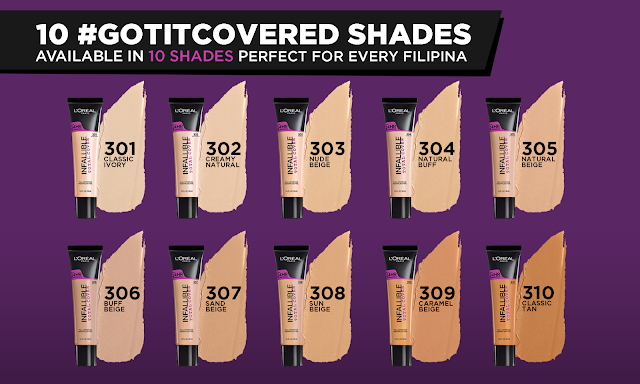 Manila 2017 – The Infallible collection has won the hearts of many Filipinas with its range of long-wearing makeup that allow them to achieve a #NeverFail look all day. This September, the franchise is making a major comeback with a huge portfolio expansion that is sure to excite even more Filipinas. Launched in the US in early 2017, it received massive buzz and high talkability online among makeup junkies and ordinary makeup users alike with its supreme power to instantly cover imperfections. And now it’s finally here in the Philippines, launching first exclusively on Lazada! Introducing the new Infallible Total Cover – a full-coverage face makeup range that will revolutionize the Filipina’s understanding of how makeup can help them achieve a perfectly flawless complexion that lasts up to 24 hours. This new range includes the INFALLIBLETOTAL COVER 24H Foundation, INFALLIBLE TOTAL COVER Color Correcting Kit, and INFALLIBLE TOTAL COVER Concealing and Contour Kit. INFALLIBLE TOTAL COVER 24HR FOUNDATION is L'Oréal's 1st 24HR weightless full coverage foundation that covers dark circles, redness, and blemishes to let you achieve perfect skin all day. Gone are the days when full coverage meant heavy and unnatural foundation. This revolutionary product allows you to have a perfected look while maintaining a weightless feel. It’s loaded with pigments to give that total coverage, and it’s enriched with Alliagel, which allows it to glide smoothly on the skin making it feel lightweight and look natural when applied. 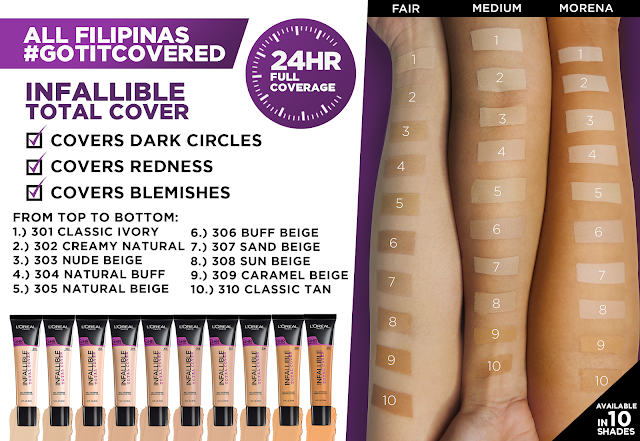 Infallible Total Cover 24H Foundation will be available in 10 shades that matchevery Filipina’s skin tone exclusively on Lazada atPhP 700 SRP. INFALLIBLE TOTAL COVER COLOR CORRECTING KIT is our all-in-1 color correcting palette that neutralizes any kind of discoloration across all skin tones and types. The powerful cream corrector helps in balancing, correcting, and perfecting imperfections on the skin. Don’t be intimidated with this multi-colored palette as each hue was made to effectively answer a specific skin need. Peach is meant to disguise dark circles, yellow to combat dark spots, green to neutralize redness, and purple to brighten dullness. Infallible Total Cover Color Correcting Kit will be available exclusively on Lazada at PhP 600 SRP. INFALLIBLE TOTAL COVER CONCEALING & CONTOUR KIT is our 3-in-1 palette that corrects dark circles, conceals imperfections, and contours the face to add depth and dimension. This pro-inspired kit provides the sophistication and completeness of a pro-palette – making you feel like an expert with your everyday look. It contains 4 highly pigmented and creamy shades that can be used individually or together for a wide array of shades and uses to fit your needs. Infallible Total Cover Concealing & Contour Kit will be available exclusively on Lazada at PhP 600 SRP.